It’s official—Sen. Kamala Harris is running! In entering the race, she becomes only the second Black woman ever to mount a serious candidacy for a major-party nomination. It’s fitting then that she announced on Martin Luther King Jr. Day, and is planning to kick off her campaign in Oakland, California, her hometown and a city rich with Black history. And like our other top-tier women candidates, she’s announced early, giving voters a chance to get to know her and donors a chance to fuel her campaign before the potential top-tier men whose intentions are still only rumors. Make sure these early announcements pay off: Pledge $20 to Sen. Harris and the other three women on our Get Them on The Stage slate. Crowdfunding on WomenCount is one way for them to hit that target and better compete with men who may have a built-in grassroots fundraising advantage from previous campaigns. Maybe that’s why more top-tier men haven’t yet announced (right now there are actually more women than men in the Democratic primary). It’s a crowded field. 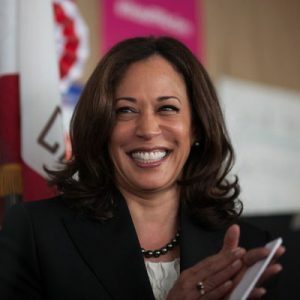 But as a former prosecutor Sen. Harris is poised to distinguish herself on holding criminals to account while reforming the justice system—critical assets if she’s the one to confront a sitting president with so many legal liabilities. Give her a boost as she makes her announcement: Pledge $20 to her and the other three candidates on our Get Them on The Stage slate. The first Democratic presidential debate is only 5 months away, so don’t wait to give.